Delete Time Limit for Usergroups plugin for MyBB. 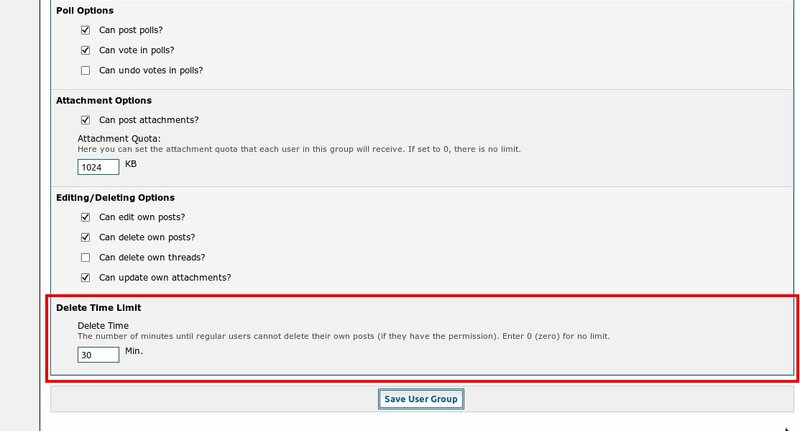 Restricts the time regular users can delete their own posts. Go to your "Admin-CP: Configuration - Plugins" and click "Install & activate" behind "Delete Time Limit for Usergroups"
In Admin CP - Users & Groups - Groups - usergroup - Options: Edit Group - tab: Forums and Posts the new setting "Delete Time Limit" is added.